Modular, easy-to-assemble court flooring from Southwest Greens in Atlanta, GA makes every tennis court fun and safe for casual and competitive play! 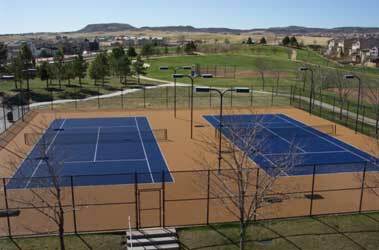 SWG tennis court tile represents the very latest in design technology from the original U.S. manufacturer of modular sports floors, Mateflex. It is specifically engineered with tennis in mind. A SWG tennis court tile surface combines the comfort and resilience of a soft court with the durability and low maintenance of a hard court. SWG tennis court tile consists of interlocking modular tiles made from an all weather blended Polypropylene material. This formulation insures both maximum player comfort and a long service life. 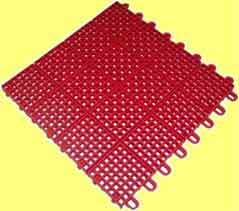 The tile material must be installed over an existing hard base such as concrete or asphalt. Although a very smooth surface is not necessary, it is important to have as flat a surface as possible. Minor cracks will not adversely affect the playing or visual qualities of the court. Court fastened around perimeter. Trim tight to fencing.